Well, on Saturday, about midnight, they began to pray, and continued in prayer till almost break of day. Now a little before it was day, good Christian, as one half amazed, brake out in passionate speech: What a fool, quoth he, am I, thus to lie in a stinking Dungeon, when I may as well walk at liberty. I have a Key in my bosom called Promise, that will, I am persuaded, open any Lock in Doubting Castle. Then said Hopeful, That’s good news; good Brother pluck it out of thy bosom and try. Then Christian pulled it out of his bosom, and began to try at the Dungeon door, whose bolt (as he turned the Key) gave back, and the door flew open with ease, and Christian and Hopeful both came out. Then he went to the outward door that leads into the Castle-yard, and with his Key opened that door also. After he went to the iron Gate, for that must be opened too, but that Lock went very hard, yet the Key did open it. Then they thrust open the Gate to make their escape with speed; but that Gate as it opened made such a creaking, that it waked Giant Despair, who hastily rising to pursue his Prisoners, felt his limbs to fail, for his Fits took him again, so that he could by no means go after them. Then they went on, and came to the King’s High-way again, and so were safe, because they were out of his jurisdiction. Lest heedlessness makes them, as we, to fare. Whose castle’s Doubting, and whose name’s Despair. Christian and Hopeful have now suffered the misery of Doubting Castle for almost four days. They were captured by Giant Despair on Wednesday morning. Now it is Saturday, almost midnight, and they begin to pray. What! Pray in the custody of Giant Despair, in the midst of Doubting Castle, and when their own folly brought them there too? Yes; mind this, ye pilgrims, ye are exhorted, “I will that men pray everywhere, without doubting” (1 Tim. 2:8). We can be in no place but God can hear, nor in any circumstance but God is able to deliver us from. And be assured, that when the spirit of prayer comes, deliverance is nigh at hand. The pilgrims pray through the early morning of the Lord’s Day. It is on the Lord’s Day that they remember Christ—the day that Christ rose from the dead—the day the church gathers each week for prayer, fellowship, and the preaching of the Word. It is on the Lord’s Day that the light of the gospel again dawns in Christian’s thinking. Bunyan’s timing here is significant. It is a subtle reminder that we need to stay under the preaching of God’s Word and seek out the prayers of God’s people, even if (and especially if) we are in the bonds of doubt and despair. Christian realizes that he has possessed the means of escape all along. He has a Key that will open any lock in Doubting Castle. The Key represents the “exceedingly great and precious promises” of the gospel—promises that are ours in Christ. Grace and peace be multiplied to you in the knowledge of God and of Jesus our Lord, as His divine power has given to us all things that pertain to life and godliness, through the knowledge of Him who called us by glory and virtue, by which have been given to us exceedingly great and precious promises, that through these you may be partakers of the divine nature, having escaped the corruption that is in the world through lust (2 Peter 1:2–4). It is the promise of eternal life and the assurance of salvation in Christ. And this is the promise that He has promised us—eternal life (1 John 2:25). For the Son of God, Jesus Christ, who was preached among you by us—by me, Silvanus, and Timothy—was not Yes and No, but in Him was Yes. For all the promises of God in Him are Yes, and in Him Amen, to the glory of God through us (2 Corinthians 1:19–20). Christian keeps the Key in his bosom (close to his heart), where he also keeps his roll (assurance of salvation)—the roll he received at the cross. The darkness of doubting caused him to forget. Now as light dawns (the understanding and application of God’s Word), he remembers. As Christian and Hopeful begin their escape, the door to their cell opens with ease. The Key also opens the door to the castle yard. But the Iron Gate that bars their exit from Doubting Castle is stubborn. 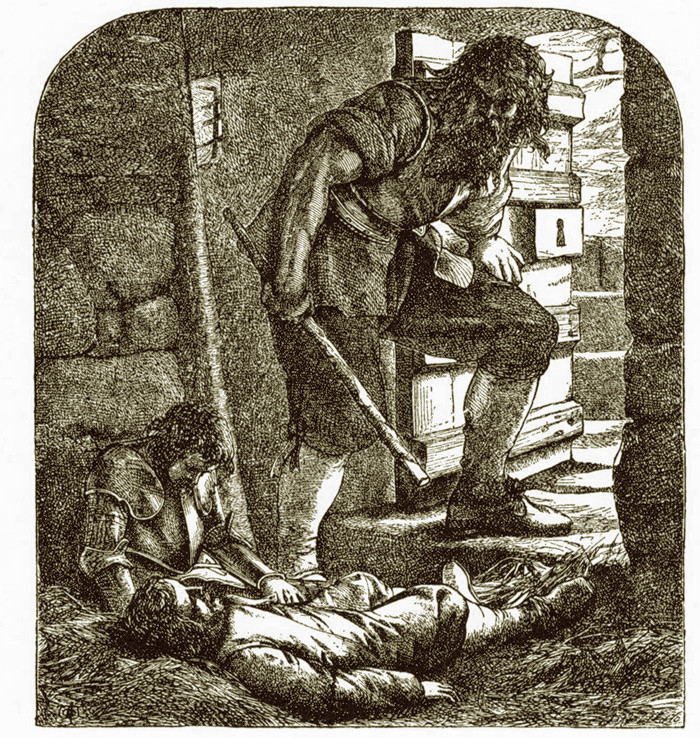 We read: “that Lock went very hard.” In the original text to The Pilgrim’s Progress, Bunyan describes the lock as opening “damnable hard.” His choice of words is strong to show the grave danger of Doubting Castle. To remain imprisoned is to place the soul in eternal peril. When doubt lays hold, and when Christ is not in view, we can have the hardest time believing that someone like us can be saved. Even when we take hold of the Key, the Lock can be stubborn. Yet the promise of the gospel will indeed open it. We need to heed the words of hope, keep turning the key in the lock, and press forward until the gate is thrust open. After I had been in this condition some three or four days, as I was sitting by the fire, I suddenly felt this word to sound in my heart, I must go to Jesus; at this my former darkness and atheism fled away, and the blessed things of heaven were set within my view. While I was on this sudden thus overtaken with surprise, Wife, said I, is there ever such a scripture, I must go to Jesus? she said she could not tell, therefore I sat musing still to see if I could remember such a place; I had not sat above two or three minutes but that came bolting in upon me, “And to an innumerable company of angels,” and withal, Hebrews the twelfth, about the mount Sion was set before mine eyes (vv 22-24). Then with joy I told my wife, O now I know, I know! But that night was a good night to me, I never had but few better; I longed for the company of some of God’s people that I might have imparted unto them what God had showed me. Christ was a precious Christ to my soul that night; I could scarce lie in my bed for joy, and peace, and triumph, through Christ; this great glory did not continue upon me until morning, yet that twelfth of the author to the Hebrews (Heb. 12:22, 23) was a blessed scripture to me for many days together after this. But you have come to Mount Zion and to the city of the living God, the heavenly Jerusalem, to an innumerable company of angels, to the general assembly and church of the firstborn who are registered in heaven, to God the Judge of all, to the spirits of just men made perfect, to Jesus the Mediator of the new covenant, and to the blood of sprinkling that speaks better things than that of Abel (Hebrews 12:22–24). He knew in his heart: “I must go to Jesus!” Christ was precious to him. Alas! alas! how many ways there are of getting into this gloomy prison! Oh, if Christ be not always with the soul, or if at any time it go astray from him, or if its reliance be on anything whatever but his mercy, his blood, his grace, then is it near the gloom of this dungeon; then may Giant Despair be heard walking in his grounds, and verily the echo of his footsteps oftentimes falls upon the soul before the grim form rises on the vision. 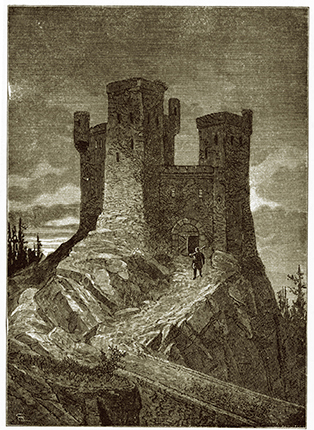 And some who have once entered the castle have stayed there a great while, because they have tried many other means of escape, than by the blood of Christ; because they have used picklocks, and penances, and stratagems, and the help of friends outside the castle, but not the key of Promise, or that not aright, not throwing themselves on the Savior alone for pardon, peace, and justification. A man who gets into difficulty through sin, will never get out by self-righteousness; nor are past sins, nor the burden of them, to be ever removed by present morality; nothing but faith, nothing but the precious blood of Christ, can take away sin, can remove the stain of it, can deliver the soul from its condemnation (from Lectures on The Pilgrim’s Progress by G.B. Cheever). Though strategies may have their place and the help of friends is welcome, they can never give us what we truly need. They cannot save us when we sin against God and others. They cannot free us from guilt when we go astray. They cannot supply the grace we need to forgive ourselves and others who sin against us. Only Christ, through His saving work on the cross, can bring us grace and mercy and forgiveness. Only in Him can we find freedom from guilt and condemnation. Only in Him can we escape doubt and despair and find peace with God. We must remember the promise of the gospel and flee to Christ! As Christian and Hopeful hasten to leave the castle, the loud creaking of the Gate arouses the giant. 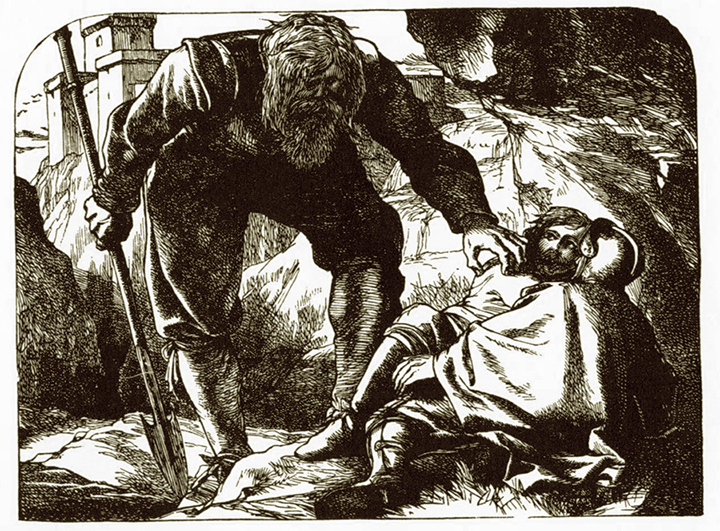 But when the giant attempts to pursue his prisoners, he falls into a seizure and cannot reclaim them. In the light of day, he has no strength. Despair cannot endure where there is clear understanding and diligent application of God’s Word. Once the pilgrims make it back to the King’s Highway, safely out of reach of Giant Despair, they place a monument near the stile where they had crossed over into By-Path Meadow. They want to warn those would follow after them on the journey. Our experiences, even our struggles and failures, can be useful to others, to warn them of danger and encourage them to keep to the Way. In time Christian’s own family, Christiana and her children, will find this monument during their own journey in Part II of The Pilgrim’s Progress. Stripped of hope and its relief. In the Gospel, set them free. Now, night being come again, and the Giant and his wife being in bed, she asked him concerning the prisoners, and if they had taken his counsel. To which he replied, They are sturdy rogues, they choose rather to bear all hardship, than to make away themselves. Then said she, Take them into the castle-yard tomorrow, and show them the bones and skulls of those that you have already dispatched, and make them believe, ere a week comes to an end, you also will tear them in pieces, as you have done to their fellows before them. So when the morning was come, the Giant goes to them again, and takes them into the castle-yard, and shows them, as his wife had bidden him. These, said he, were pilgrims as you are, once, and they trespassed in my grounds, as you have done; and when I thought fit, I tore them in pieces, and so, within ten days, I will do you. Go, get you down to your den again; and with that he beat them all the way thither. They lay, therefore, all day on Saturday in a lamentable case, as before. Now, when night was come, and when Mrs. Diffidence and her husband, the Giant, were got to bed, they began to renew their discourse of their prisoners; and withal the old Giant wondered, that he could neither by his blows nor his counsel bring them to an end. And with that his wife replied, I fear, said she, that they live in hope that some will come to relieve them, or that they have picklocks about them, by the means of which they hope to escape. And do you say so, my dear? said the Giant; I will, therefore, search them in the morning. Despite Hopeful’s reassurance, the darkness returns. Night comes again and Christian and Hopeful still remain in the oppressive bonds of Doubting Castle. It seems that there is no end to their captivity. Giant Despair and his wife, Diffidence devise their plans in the dark, at night, when there is no light. Diffidence (lack of trust or unbelief) will always send us Despair to bludgeon and abuse us. Diffidence plots and directs; Despair carries out her cruel designs. He does her bidding. Diffidence tells her husband: “Take them into the castle-yard tomorrow, and show them the bones and skulls of those that you have already dispatched, and make them believe, ere a week comes to an end, you also will tear them in pieces, as you have done to their fellows before them.” The castle-yard represents the lives of those shattered by sin and devastated by despair. It is the hopelessness of a fallen world that has been blinded to the truth of God’s Word and the ruin of those who have strayed from the Way and denied the faith. Diffidence is sure that the sight of such brokenness and failure will extinguish whatever resolve the pilgrims may yet possess. He would have us glory in tribulation that it might bring us to hope. And not only that, but we also glory in tribulations, knowing that tribulation produces perseverance; and perseverance, character; and character, hope. Now hope does not disappoint, because the love of God has been poured out in our hearts by the Holy Spirit who was given to us (Romans 5:3–5). He would have us cry out to Him in faith that we might be delivered from oppression. Giant Despair is confounded at the perseverance of the pilgrims. Diffidence fears that they may yet hope of escape. She suggests that they may, in fact, possess the means to escape. Giant Despair intents to search them in the morning. In the next post, we will see how the pilgrims indeed are able to escape the misery of Doubting Castle. Now, Giant Despair had a wife, and her name was Diffidence. So when he was gone to bed, he told his wife what he had done; to wit, that he had taken a couple of prisoners and cast them into his dungeon, for trespassing on his grounds. Then he asked her also what he had best to do further to them. So she asked him what they were, whence they came, and whither they were bound; and he told her. Then she counselled him that when he arose in the morning he should beat them without any mercy. So, when he arose, he getteth him a grievous crab-tree cudgel, and goes down into the dungeon to them, and there first falls to rating of them as if they were dogs, although they never gave him a word of distaste. Then he falls upon them, and beats them fearfully, in such sort that they were not able to help themselves, or to turn them upon the floor. This done, he withdraws and leaves them there to condole their misery and to mourn under their distress. So all that day they spent the time in nothing but sighs and bitter lamentations. The next night, she, talking with her husband about them further, and understanding they were yet alive, did advise him to counsel them to make away themselves. So when morning was come, he goes to them in a surly manner as before, and perceiving them to be very sore with the stripes that he had given them the day before, he told them, that since they were never like to come out of that place, their only way would be forthwith to make an end of themselves, either with knife, halter, or poison, for why, said he, should you choose life, seeing it is attended with so much bitterness? But they desired him to let them go. With that he looked ugly upon them, and, rushing to them, had doubtless made an end of them himself, but that he fell into one of his fits, (for he sometimes, in sunshiny weather, fell into fits), and lost for a time the use of his hand; wherefore he withdrew, and left them as before, to consider what to do. Christian: Brother, said Christian, what shall we do? The life that we now live is miserable. For my part I know not whether is best, to live thus, or to die out of hand. “My soul chooses strangling rather than life” and the grave is more easy for me than this dungeon. Shall we be ruled by the Giant? Christian and Hopeful lie imprisoned in Doubting Castle. They were overpowered by Giant Despair and forced into his dark dungeon. But despair is not the only struggle the pilgrims must face. Giant Despair has a wife and her name is Diffidence. According to Mirriam-Webster, the term “diffidence” comes from a combination of the Latin verb fidere (to trust), and the prefix dis (the absence of). It is the opposite of “confidence” — con (with) and fidere (to trust). In modern usage “diffidence” means timidity or lack of confidence. It describes those who are hesitant and unsure of themselves. But in Bunyan’s day, the term had the broader meaning of distrust or lack of faith. Scripture exhorts us to: “Watch, stand fast in the faith, be brave, be strong” (1 Corinthians 16:13). As a mature believer, Christian should be “sound in faith” (Titus 2:2) and an example to younger believers like Hopeful. Yet Christian strayed and caused Hopeful to stray with him. 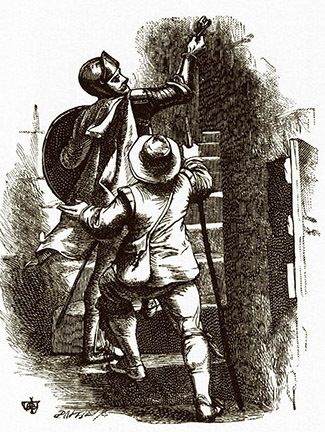 Christian’s failure to walk and lead faithfully caused him to trespass on the grounds of Doubting Castle. Now locked away in its prison, he battles not only despair, but also distrust. His faith wanes; he falls into unbelief. And death rather than my body (Job 7:15). But this is a giant that cannot tolerate the light. He falls into a fit in “sunshiny weather.” Despair loses its strength in the light of God’s Word. Despair loses its grip when truth is brought to bear. Christian can be thankful that he is not facing this oppression alone. He has Hopeful for a companion. In the next post we will hear Hopeful’s answer and reassurance. Last month we had the privilege at Grace Baptist Church in Cape Coral of hearing from Conrad Mbewe. On New Year’s Day 2017 Dr. Mbewe, who serves as Pastor of Kabwata Baptist Church in Lusaka, Zambia, preached a message from John 3:16 entitled “God’s Indescribable Love.” He encouraged us to begin the new year with our souls “anchored deep” in the unfailing love of God in Christ. Sometimes the verses we think we know best are the ones we can learn from the most. That is certainly true of John 3:16. Anytime we are under the preaching of God’s Word, we need to listen intently, and even more so when the passage is familiar and we think we know what the preacher is going to say. Scripture is an inestimable and inexhaustible treasure. We need to hear it expectantly (even parts we think we know) and let it dwell in us “richly” (Colossians 3:16). This hymn is my reflection on the verse and the message. The love of God that He has given us in His Son is a sure fortress that shelters us through every storm and trial. The heights of His great love. In Christ I rest secure. Give praise to God and sing! To which you now can cling. My soul He’ll safely keep. My soul is anchored deep. Download the lyrics and free sheet music for this hymn. Download a free Lyric Print (PDF) of the words to this hymn. About the midst of this valley, I perceived the mouth of hell to be, and it stood also hard by the wayside. Now, thought Christian, what shall I do? And ever and anon the flame and smoke would come out in such abundance, with sparks and hideous noises, (things that cared not for Christian’s sword, as did Apollyon before), that he was forced to put up his sword, and betake himself to another weapon called All-prayer. So he cried in my hearing, “O Lord, I beseech thee, deliver my soul!” Thus he went on a great while, yet still the flames would be reaching towards him. Also he heard doleful voices, and rushings to and fro, so that sometimes he thought he should be torn in pieces, or trodden down like mire in the streets. This frightful sight was seen, and these dreadful noises were heard by him for several miles together; and, coming to a place where he thought he heard a company of fiends coming forward to meet him, he stopped, and began to muse what he had best to do. Sometimes he had half a thought to go back; then again he thought he might be half way through the valley; he remembered also how he had already vanquished many a danger, and that the danger of going back might be much more than for to go forward; so he resolved to go on. Yet the fiends seemed to come nearer and nearer; but when they were come even almost at him, he cried out with a most vehement voice, “I will walk in the strength of the Lord God!” so they gave back, and came no further. One thing I would not let slip. I took notice that now poor Christian was so confounded, that he did not know his own voice; and thus I perceived it. Just when he was come over against the mouth of the burning pit, one of the wicked ones got behind him, and stepped up softly to him, and whisperingly suggested many grievous blasphemies to him, which he verily thought had proceeded from his own mind. This put Christian more to it than anything that he met with before, even to think that he should now blaspheme him that he loved so much before; yet, if he could have helped it, he would not have done it; but he had not the discretion either to stop his ears, or to know from whence these blasphemies came. First, Because he gathered from thence, that some who feared God were in this valley as well as himself. Secondly, For that he perceived God was with them, though in that dark and dismal state; and why not, thought he, with me? though, by reason of the impediment that attends this place, I cannot perceive it. Thirdly, For that he hoped, could he overtake them, to have company by and by. So he went on, and called to him that was before; but he knew not what to answer; for that he also thought to be alone. As Christian continues his dark journey through the Valley of the Shadow of Death, his trouble only deepens. When he reaches the middle of the valley he comes near the mouth of hell and here he is tormented with voices of terror and temptation. He feels threatened and senses that both fiends (alluring him into sin) and flames (threatening him with judgment) are coming after him. 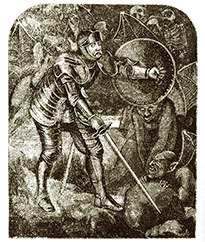 Christian is so confounded that he is no longer able to wield his sword. There is nothing identifiable in his thinking upon which he can bring truth to bear. And so he turns to another weapon of spiritual warfare: All-Prayer. … praying always with all prayer and supplication in the Spirit, being watchful to this end with all perseverance and supplication for all the saints (Ephesians 6:18). Finally, my brethren, be strong in the Lord and in the power of His might (Ephesians 6:10). 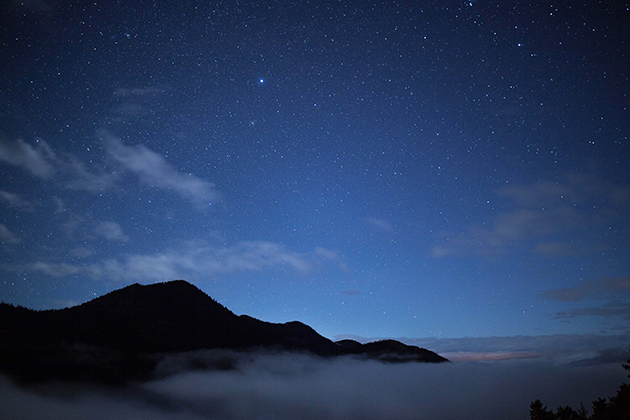 Bunyan describes the valley as dark and confusing. Christian hears voices whispering blasphemies and temptations, but their source is uncertain. He becomes so confused that he even begins to doubt his own testimony and can’t recognize his own voice. In the Valley of Humiliation the enemy was clear. Apollyon stood against him and Christian stood his ground. But now in this valley the enemy is unclear and clandestine. When Christian searches for his foe, it appears to be within his own mind, maybe even himself. He is perplexed and grieved that he could be thinking such wicked thoughts. For, about the space of a month after, a very great storm came down upon me, which handled me twenty times worse than all I had met with before; it came stealing upon me, now by one piece, then by another: First, all my comfort was taken from me; then darkness seized upon me; after which, whole floods of blasphemies, both against God, Christ, and the scriptures, were poured upon my spirit, to my great confusion and astonishment. These blasphemous thoughts were such as stirred up questions in me against the very being of God, and of His only beloved Son: As, whether there were in truth, a God or Christ? And whether the Holy Scriptures were not rather a fable, and cunning story, than the holy and pure word of God? Like Christian in The Pilgrim’s Progress, Bunyan was fearful and distressed that such terrible thoughts would come from within himself. Now I thought, surely I am possessed of the devil: at other times, again, I thought I should be bereft of my wits; for instead of lauding and magnifying God the Lord, with others, if I have but heard Him spoken of, presently some most horrible blasphemous thought or other would bolt out of my heart against Him; so that whether I did think that God was, or again did think there was no such thing, no love, nor peace, nor gracious disposition could I feel within me. These things did sink me into very deep despair; for I concluded that such things could not possibly be found amongst them that loved God. I often, when these temptations had been with force upon me, did compare myself to the case of such a child, whom some gipsy hath by force took up in her arms, and is carrying from friend and country. Kick sometimes I did, and also shriek and cry; but yet I was bound in the wings of the temptation, and the wind would carry me away. I thought also of Saul, and of the evil spirit that did possess him: and did greatly fear that my condition was the same with that of his (1 Samuel 10). 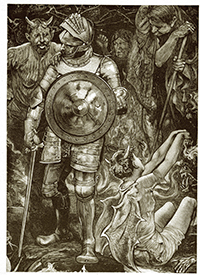 Bunyan doubted his own faith and mistakenly believed that he was alone in his struggle against sin and the devil. And now my heart was, at times, exceeding hard; if I would have given a thousand pounds for a tear, I could not shed one: no nor sometimes scarce desire to shed one. I was much dejected, to think that this would be my lot. I saw some could mourn and lament their sin; and others again, could rejoice and bless God for Christ; and others again, could quietly talk of, and with gladness remember the word of God; while I only was in the storm or tempest. This much sunk me, I thought my condition was alone, I should therefore much bewail my hard hap, but get out of, or get rid of these things, I could not. While this temptation lasted, which was about a year, I could attend upon none of the ordinances of God, but with sore and great affliction. Yea, then I was most distressed with blasphemies. If I had been hearing the word, then uncleanness, blasphemies and despair would hold me a captive there: if I have been reading, then sometimes I had sudden thoughts to question all I read: sometimes again, my mind would be so strangely snatched away, and possessed with other things, that I have neither known, nor regarded, nor remembered so much as the sentence that but now I have read. No temptation has overtaken you except such as is common to man; but God is faithful, who will not allow you to be tempted beyond what you are able, but with the temptation will also make the way of escape, that you may be able to bear it (1 Corinthians 10:13). One of God’s great gifts is to give us brothers and sisters in the faith to walk with us and encourage us. As Christian walks downcast through the valley, he hears ahead of him the voice of another pilgrim quoting the Word of God. 1. He realizes that he is not alone in the valley. Others are facing the same trials and temptations as he, and are trusting in God for help and comfort. We don’t have to be alert and aware for God to be at work. Even when we are confounded and dismayed, He is still sovereign and in control. Even when we are downcast and uncertain, He remains strong and faithful. 3. Christian realizes that a fellow pilgrim is close by. He can gain the blessing of company and consolation if he can meet up with his brother. Christian calls out to get the other’s attention, but hears no answer. The other pilgrim is yet out of sight and believes himself to be alone in the valley as well. The Valley of the Shadow of Death teaches us an important lesson about the Christian life. It is possible for believers, who are following the Way and walking according to God’s will, to go through dark and difficult days. They may go through times, even seasons, of severe oppression and trial. The valley can be long. 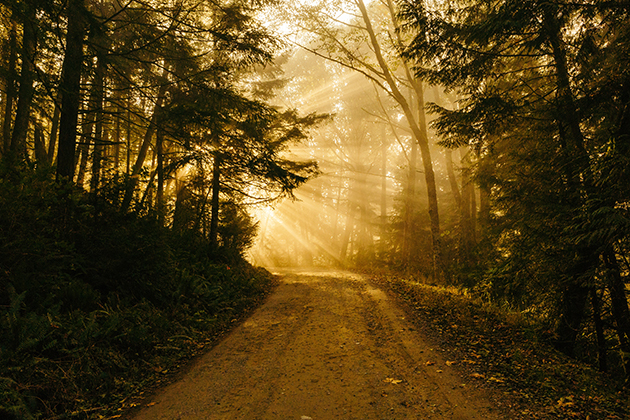 Christian plods on for “several miles” and is disconsolate “for some considerable time.” How are we to follow Christ when the days are dark and we are so confounded and perplexed, we don’t know what to do? In those times we must not look to our own strength and understanding. We must walk as Christian, praying always and pressing on in the strength of the Lord. As we walk by faith, trusting in the promises of God’s Word, we will be encouraged. And though we may not see it, in God’s kindness, our perseverance might be an encouragement to others to press on as well. Now here Christian was worse put to it than in his fight with Apollyon, as by the sequel you shall see. Christian: Whither are you going? Men: They said, Back! back! And we would have you to do so too, if either life or peace is prized by you. Christian: Why, what’s the matter? said Christian. Men: Matter! said they; we were going that way as you are going, and went as far as we durst; and indeed we were almost past coming back; for had we gone a little further, we had not been here to bring the news to thee. Christian: But what have you met with? said Christian. Men: Why, we were almost in the Valley of the Shadow of Death; but that, by good hap, we looked before us, and saw the danger before we came to it. Christian: But what have you seen? said Christian. Men: Seen! Why, the Valley itself, which is as dark as pitch; we also saw there the hobgoblins, satyrs, and dragons of the pit; we heard also in that Valley a continual howling and yelling, as of a people under unutterable misery, who there sat bound in affliction and irons; and over that Valley hangs the discouraging clouds of confusion. Death also doth always spread his wings over it. In a word, it is every whit dreadful, being utterly without order. Christian: Then, said Christian, I perceive not yet, by what you have said, but that this is my way to the desired haven. Men: Be it thy way; we will not choose it for ours. So, they parted, and Christian went on his way, but still with his sword drawn in his hand, for fear lest he should be assaulted. I saw then in my dream, so far as this valley reached, there was on the right hand a very deep ditch; that ditch is it into which the blind have led the blind in all ages, and have both there miserably perished. Again, behold, on the left hand, there was a very dangerous quag, into which, if even a good man falls, he can find no bottom for his foot to stand on. Into that quag King David once did fall, and had no doubt therein been smothered, had not HE that is able plucked him out. The pathway was here also exceeding narrow, and therefore good Christian was the more put to it; for when he sought, in the dark, to shun the ditch on the one hand, he was ready to tip over into the mire on the other; also when he sought to escape the mire, without great carefulness he would be ready to fall into the ditch. Thus he went on, and I heard him here sigh bitterly; for, besides the dangers mentioned above, the pathway was here so dark, and ofttimes, when he lift up his foot to set forward, he knew not where or upon what he should set it next. No sooner did Christian come out of one difficult valley than he went down into one much worse. In the Valley of Humiliation Christian faced the reality of his own neediness and sinfulness. He confronted the enemy, Apollyon, the accuser of his soul, and he fought valiantly for truth. But now in the Valley of the Shadow of Death the way has become dark and clouded. The enemy is less clear. In the midst of trial and temptation Christian must face his doubts and fears and uncertainties. This second valley represents the struggles and oppression we face in our pilgrimage when we can no longer see clearly the light of the gospel. Truth is shrouded in darkness. Temptation and sin threaten to cast us down. 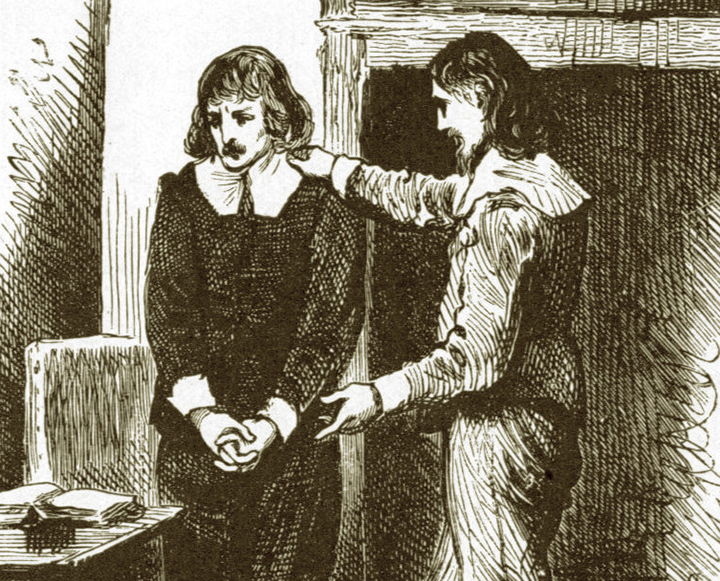 As Christian crosses the boundary between the valleys, he meets two men whom Bunyan describes as descendents of the ten spies in Numbers 13 who lacked faith and gave a bad report. And they gave the children of Israel a bad report of the land which they had spied out, saying, “The land through which we have gone as spies is a land that devours its inhabitants, and all the people whom we saw in it are men of great stature” (Numbers 13:32). Moses had sent twelve to spy out the Promised Land and only Joshua and Caleb had faith that God would conquer the inhabitants and give the land to Israel. The remaining ten were fearful and doubted God’s promise. Their lack of faith infected Israel and for forty years Israel wandered in the wilderness and was prevented from taking possession of the land. Like the faithless spies, the two men fleeing the valley had turned back in fear and they encourage Christian to do the same. But Christian had learned perseverance on his journey. He saw the lesson in the House of the Interpreter of the Valiant Man determined to gain entrance to the Stately Palace. When he was climbing Hill Difficulty, he met Timorous and Mistrust who were running from the lions. They also encouraged Christian to turn back, yet Christian persevered until he came to Palace Beautiful. Christian understands that if he is to attain eternal life, the way at times will be hard and trying. And now the way has brought Him to the Valley of the Shadow of Death. There is no way around it. “The way to the Celestial City lay through the midst of it” and so “Christian must needs go through it.” There are more lessons for Christian to learn, even as he faces dark and difficult days. Get the idea of a narrow ravine, something like the Gorge of Gondo or some other stern pass upon the higher Alps where the rocks seem piled to Heaven and the sunlight is seen above as through a narrow rift. Troubles are sometimes heaped on one another, pile on pile, and the road is a dreary pass through which the pilgrim, on his journey to Heaven, has to wend his way. Set before your mind’s eye a valley shut in with stupendous rocks that seem to meet overhead, a narrowing pass, dark as midnight itself. Through this valley, or rocky ravine, the heavenly footman has to follow the path appointed for him in the eternal purpose of the Infinite mind. Through such a dreary rift many a child of God is making his way at this moment—and to him I speak (C.H. Spurgeon, “The Valley of the Shadow of Death” a sermon delivered on August 12, 1880, Metropolitan Tabernacle #1595). Again, as I was at another time very ill and weak, all that time also the tempter did beset me strongly, for I find he is much for assaulting the soul when it begins to approach towards the grave, then is his opportunity, laboring to hide from me my former experience of God’s goodness; also setting before me the terrors of death and the judgment of God, insomuch that at this time, through my fear of miscarrying for ever, should I now die, I was as one dead before death came, and was as if I had felt myself already descending into the pit; methought, I said, there was no way, but to hell I must; but behold, just as I was in the midst of those fears, these words of the angels carrying Lazarus into Abraham’s bosom darted in upon me, as who should say, So it shall be with thee when thou dost leave this world. This did sweetly revive my spirit, and help me to hope in God; which, when I had with comfort mused on a while, that word fell with great weight upon my mind, “O death, where is thy sting? O grave, where is thy victory?” (1Corinthians 15:55). At this I became both well in body and mind at once, for my sickness did presently vanish, and I walked comfortably in my work for God again. At another time, though just before I was pretty well and savory in my spirit, yet suddenly there fell upon me a great cloud of darkness, which did so hide from me the things of God and Christ, that I was as if I had never seen or known them in my life; I was also so overrun in my soul, with a senseless, heartless frame of spirit, that I could not feel my soul to move or stir after grace and life by Christ; I was as if my loins were broken, or as if my hands and feet had been tied or bound with chains. At this time also I felt some weakness to seize upon my outward man, which made still the other affliction the more heavy and uncomfortable ‘to me. Bunyan notes that the path through the valley is hemmed in by a ditch on one side and a quag on the other. The ditch represents falling into sinful error. We stumble into its deep chasms when we are blind to the truth and believe what is false, when we fail to recognize and acknowledge sin as sin, when underestimate the power of temptation and treat sin lightly and casually. The quag on the opposite side of the path represents our being overtaken by sin and overwhelmed with doubts and fears and guilt. We sink in its mire when we are beaten down by temptations; when we are weighed down with despair and excessive sorrow; when we feel defeated by struggles and laid low by setbacks. When we try to avoid falling into the ditch by exposing our sins with truth, we are in danger of the quag, being overwhelmed with our exceeding sinfulness. When we try to avoid the quag by silencing our sins with hope of forgiveness, we are in danger of the ditch, being careless in our walk and presumptuous in our obedience. The only safe path through this dark valley is Christ. He is the way and the truth and the life. He keeps us from falling to the right or left. In Him we find forgiveness; the Law no more condemns us. And in Him we find strength to walk in newness of life; the Law is our delight. We must learn to have faith as David did. We must readily repent of sin and anchor our faith in the Lord Jesus Christ. We must receive the guidance and discipline of our kind Shepherd. Our path at times can be dark and uncertain. But it is God’s will and purpose that we walk such paths and learn more deeply to trust Him. Though the way may be clouded and unclear, we must press on to glory. Though we may not be able to see even where our next footstep will land, God is faithful and He will lead us safely home.